Posted on September 7, 2017 by Anmol K.
On August 7th 2017, Mission Viejo was graced with a visit from world famous author, Meg Cabot. 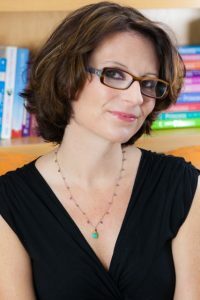 There to promote her latest novel, Royal Crush, Meg Cabot has wrote many books; she has written the Princess Diaries, The Meditator, 1-800-WHERE-R-U, All-American Girl, Avalon High, The Airhead, and The Abandon series. In addition to this, she wrote numerous standalone novels. With such a wide collection of works, there is sure to be something for everyone. Just like the various characters Meg Cabot has wrote about, she has an interesting life story. Born in Bloomington Indiana, Meg Cabot started to write stories from the age of seven. She was a big fan of Star Wars, and admired Princess Leia so much, that she wrote stories about her. As she grew older, she realized she could not do that, but she still loved Star Wars. In high school, she flunked math because she was too busy drawing all the time because she loved it as much as writing. After high school, Ms. Cabot attended Indiana University. Not sure about her major, she runs into a guy at a party who tells her not to major in creative writing. Taking his advice, she decides to major in art. During her time at college, she did not take a single writing class. At graduation, her diploma tube was empty because of that. After graduation, Ms. Cabot moved to New York where she worked as an assistant residence hall director at New York University. There, she met the same guy from the party who told her that he was drunk at that time, and did not know what he was saying. They started to date, eventually got married, and have been married for over twenty years. Around the same time, her Father passed away, which really hurt her. She also decided to start publishing her works, but they kept getting rejected. Three years later, Ms. Cabot finally published her first novel, Where Roses Grow Wild, under her pen name of Patricia Cabot at the age of thirty. Her most famous series, Princess Diaries, was originally based on Cabot’s life about a woman her age having her mother starting to date her teacher. After writing about it, her friends feel it’s weird, so Ms. Cabot makes the girl fourteen, but nothing really happens. Ms. Cabot revises the story to make the girl a long-lost princess, and Princess Diaries is born. An interesting fact about the series is that the Father is not in the movie because the producers wanted Julie Andrews, who plays the grandmother, to have a lot of speaking parts. As a writer, Ms. Cabot gets ideas for her novels from everywhere. Some are based on her own anecdotes, while others are just from her imagination. She advises aspiring writers to never give up their dreams. She lives in Key West, Florida with her husband and her many cats. Royal Crush and the works of Meg Cabot are available for checkout from the Mission Viejo Library.